Biophysics of Taste: Introduction. Salty Taste Transduction. Sour Taste Transduction. Sweet Taste Transduction. Bitter Taste Transduction. Umami Taste Transduction. The Question of Receptors. G. Proteins. Biophysics and Behavior: Is There a Link? References. The Neural Code and Integrative Processes of Taste: Introduction. Taste System Anatomy. Physiology of Gustatory Afferent Neurons. Coding of Taste Quality. Integrative Mechanisms of Taste. References. Psychophysics of Taste: Prologue. Introduction. Some Fundamental Questions of Taste Reductions. Overview. References. Olfactory Psychophysics: Introduction. Detection and Thresholds. Intensity Relationships. Mixtures. Informational Content of Odors. Odor Categories. Issues, Needs, and Directions. References. 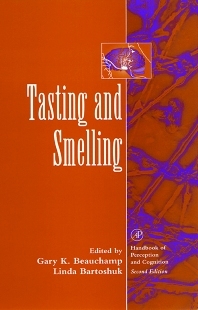 Clinical Disorders of Smell and Taste: Introduction. Smell versus Taste: Confusion and Relative Vulnerabilities. Smell Disorders. Taste Disorders. Conclusion. References. The Ontogeny of Human Flavor Perception: Introduction. Sensory Systems That Detect Flavor. Responsiveness of the Fetus and Premature Infant to Flavors. Taste and Olfactory Perception during Human Infancy. Early Responsiveness by the Human Infant to Flavor: Example of Mother's Milk. Conclusions and Future Directions. References. Index. Tasting and Smelling presents a comprehensive overview to research on these two important modes of perception. The book offers a review of research findings on the biophysics, neurophysiology, and psychophysicsof both senses, as well as discussing the emotional component associated with taste and smell, and clinical disorders affecting each of these two senses. Tasting and Smelling answers how odors and flavors are perceived, why we have favorites, and what happens when our senses go awry. This book is of interest to the researcher in perception, cognition, or neurophysiology. Academic researchers and professionals in perception, with an interest in taste and smell. Yale University School of Medicine, New Haven, Connecticut, U.S.A.